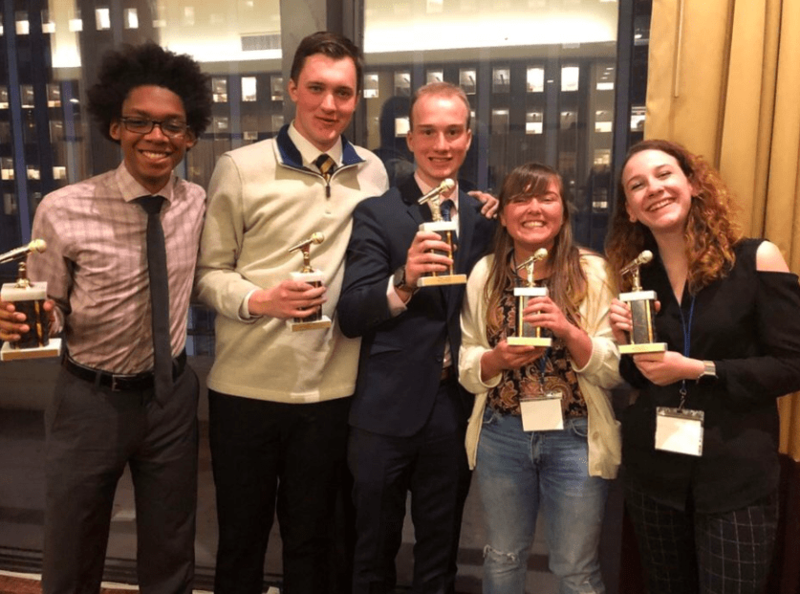 The UCCS Radio made the finals in four categories at the 79th annual Intercollegiate Broadcast System (IBS) Awards and Media Conference in New York City. As members of the Intercollegiate Broadcast System (IBS), the UCCS Radio competes each year against 300 other college radio stations in a variety of categories. Five members of the UCCS Radio along with Sabrina Weinholtz attended the conference that occurred March 1-2 on behalf of their four nominations. The nominated shows included “Rivers of the Mind” for Best Radio Drama, “The Two-Minute Drill” for Best Sports Talk Program, “Songs from T.V. Shows that Nate Likes” for Best Show Promotional Poster and “Runners in Scoring Positions” for Best Podcast. Ellis said that she is proud to have made finals among hundreds of categories and nomination. Since attending the IBS awards and conference, the UCCS Radio now plans to restructure in efforts to improve programming and accessibility. “The conference helped us figure out a game plan. We want to expand social media presence and work in part with other media on campus,” said Ellis. Junior biomedical science major and UCCS Station Manager, Maddie Ellis, attended the award ceremony and conference with Nathaniel Jones, Philip Oke-Thomas, Charlie Cowan and Alyssa Premovich. Ellis is the host of “Bombination,” a themed music show featuring her favorite indie/folk/alternative artists of the week. Alumni Timmy Vilgiate hosts “Rivers of the Mind,” a psychedelic chronicle of the adventures of a homeless man who develops superpowers while taking LSD in a hole under the universe. Freshman Charlie Cowan hosts “Runners in Scoring Positions,” a weekly podcast on baseball. Junior political science major Philip Oke-Thomas, co-host of “The Two-Minute Drill” with senior Nathaniel Jones, traveled to New York City for the first time for the awards ceremony and conference. “We stayed at Hotel Pennsylvania, which is right near Madison Square Garden and Grand Central Station. We were just in the thick of it,” said Oke-Thomas. Philip Oke-Thomas expressed gratitude for the opportunity to travel to New York with his friends. The conference also helped Oke-Thomas establish some goals for “The Two-Minute Drill.” He said he wants to develop more and better connections with the Denver Nuggets and continue to include more guests on the show. According to Ellis, along with the awards ceremony, there were two full days of the seminar. They learned how to promote radio better through social media, specifically how to work as a media organization in universities whether co-curricular or within a communication department. They also learned about structure and branding. “The seminars were based heavily on podcasts this year because their huge right now, they’re blowing up,” said Ellis. UCCS Radio helped the Asian Pacific Islander Student Union with their Fusion event on March 14. They will play music for the Bash the Bluffs 5k on April 26 and the Just Kick It! UCCS Mini World Cup event with MOSAIC and the Recreation and Wellness Center on April 27. In April, UCCS Radio also hopes to facilitate a battle of the bands event, similar to ones that have been held in the past. “Students at the UCCS Radio are able to contribute to the overall culture of the school and make a product. I think the communication aspect is unique. It gives you a professionalism piece and also a creative outlet piece,” said Ellis. There are 25 students on staff now and 23 of them are volunteers. According to Ellis, part of restructuring UCCS Radio is extending paid positions to more people to keep retention. The media fee allows them to monetarily compensate staff. According to the IBS website, the awards honor excellence in programming, air personalities, public service efforts and outstanding stations. For students who have any event suggestions or are interested in being a DJ, please contact UCCS Radio at radio@uccs.edu. Their website is radio.uccs.edu/.